Shapes the Game is a dexterity game where players take turns playing cards and placing pieces on a central platform. In the standard version of the game, you start out with a hand of cards and must get rid of all of your cards to win the game. In Shapes the Game: Survivor, players take turns drawing cards and placing the card drawn onto the central platform. In this scenario, the last person to place their piece without anything falling is the winner. 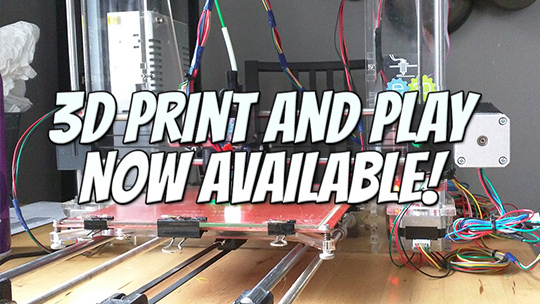 We're happy to announce that we now have a 3D Print and Play available for download/purchase. 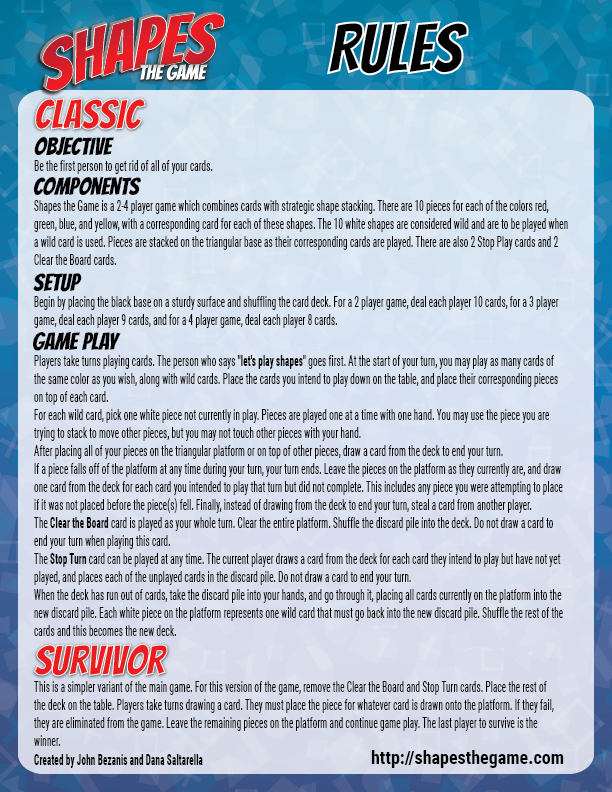 We also have a Gameplay and Rules video available so you can see how the game is played in both gameplay styles. Thanks for checking out our game. We're looking forward to seeing more and more people bring Shapes the Game to their Board Game night! Be the first person to get rid of all of your cards. 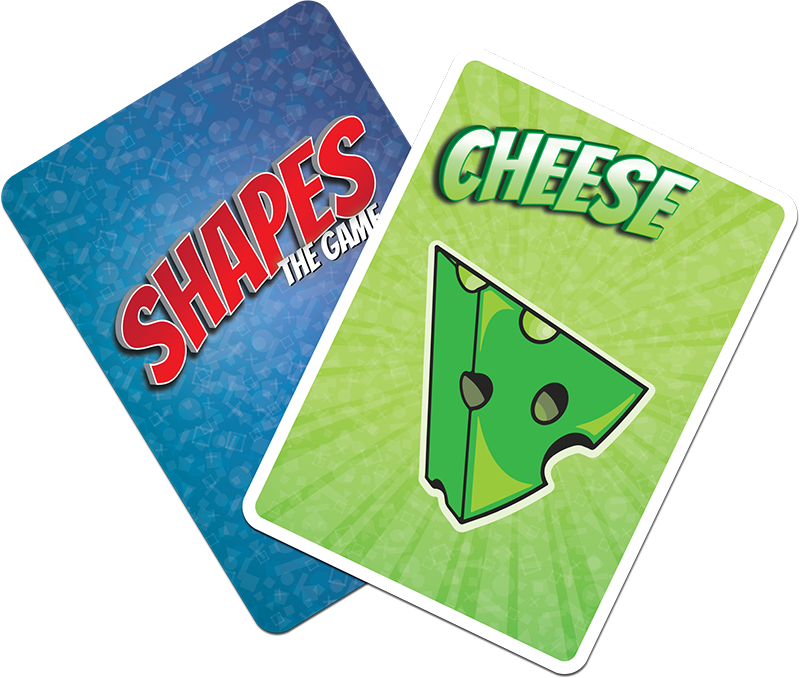 Shapes the Game is a 2-4 player game which combines cards with strategic shape stacking. There are 10 pieces for each of the colors red, green, blue, and yellow, with a corresponding card for each of these shapes. The 10 white shapes are considered wild and are to be played when a wild card is used. Pieces are stacked on the triangular base as their corresponding cards are played. There are also 2 Stop Turn cards and 2 Clear the Board cards. Begin by placing the black base on a sturdy surface and shuffling the card deck. For a 2 player game, deal each player 10 cards, for a 3 player game, deal each player 9 cards, and for a 4 player game, deal each player 8 cards. Players take turns playing cards. The person who says "let's play shapes" goes first. At the start of your turn, you may play as many cards of the same color as you wish, along with wild cards. Place the cards you intend to play down on the table, and place their corresponding pieces on top of each card. For each wild card, pick one white piece not currently in play. Pieces are played one at a time with one hand. You may use the piece you are trying to stack to move other pieces, but you may not touch other pieces with your hand. After placing all of your pieces on the triangular platform or on top of other pieces, draw a card from the deck to end your turn. If a piece other than the piece being placed falls off of the platform at any point during your turn, your turn ends. Leave the pieces on the platform as they currently are, and draw one card from the deck for each card you intended to play that turn but did not complete. This includes any piece you were attempting to place if it was not placed before the piece(s) fell. Finally, instead of drawing from the deck to end your turn, steal a card from another player. The Clear the Board card is played as your whole turn. Clear the entire platform. Shuffle the discard pile into the deck. Do not draw a card to end your turn when playing this card. The Stop Turn card can be played at any time. The current player draws a card from the deck for each card they intend to play but have not yet played, and places each of the unplayed cards in the discard pile. Do not draw a card to end your turn. When the deck has run out of cards, take the discard pile into your hands, and go through it, placing all cards currently on the platform into the new discard pile. Each white piece on the platform represents one wild card that must go back into the new discard pile. Shuffle the rest of the cards and this becomes the new deck. This is a simpler variant of the main game. For this version of the game, remove the Clear the Board and Stop Turn cards. Place the rest of the deck on the table. Players take turns drawing a card. They must place the piece for whatever card is drawn onto the platform. If they fail, they are eliminated from the game. Leave the remaining pieces on the platform and continue game play. The last player to survive is the winner. For this variant, remove the Stop Turn and Clear the Board cards. Players take turns drawing 3 cards. The player chooses one card to play, one card they must pass to any other player, and one card to discard. If a piece other than the piece being placed falls off of the platform, the current player is eliminated. Leave the remaining pieces on the platform as they are. At the start of your turn, you must first play any cards that other players passed to you, and then draw your 3 cards. When playing a wild card on yourself, you may choose any white piece. When playing a wild card on another player, you may choose the white piece that they must play. For this variant, remove the Stop Turn and Clear the Board cards. For a 2 player game, deal each player 10 cards. For a 3 player game, deal each player 9 cards. For a 4 player game, deal each player 8 cards. Each player selects one card and passes the rest to the person to their left. Play continues like this until all cards have been selected. Next, place all of your cards face down in front of you in the order in which you wish to play, from left to right. You may look at the cards and order them however you wish. Players take turns playing their left-most card. If a piece other than the piece being placed falls off of the platform, the current player is eliminated. Leave the remaining pieces on the platform as they are. If all cards are played, all players draft 5 more cards.